The cause and effect relationship between noise exposure and hearing loss has been established for many years. Existing studies indicate a link between industry, occupation, and noise-induced hearing loss (NIHL) with a higher prevalence or risk of hearing impairment in the railroad, mining, and metal manufacturing industries. ,, NIHL is caused by acoustic trauma, after a single exposure to an excessive sound, for example an explosion, or is a disease process that occurs gradually over many years of exposure to less intense noise levels and in the majority is due to occupational or industrial exposure (chronic NIHL). 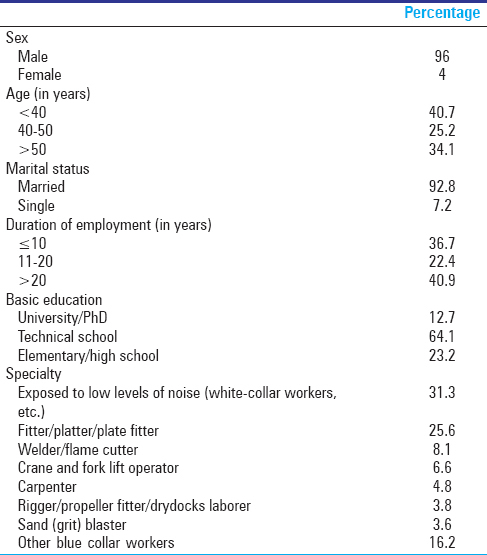 The aim of this study is to investigate the prevalence of occupational hearing loss among specific occupational groups of blue- and white-collar workers in a shipyard industry in Greece and to explore the correlations with other job and individual-related factors. Other blue collar workers (building workers, car washers, scuba divers, dockers, cooling, plumbers, car drivers, ship cleaners, radiomen, car mechanics, technicians, pipe fitters, tugboat personnel, e.g., captain and sailors, practical engineers, etc.). Data were collected during the period 2006-2009 as part of the periodic medical examination in the occupational health department. All employees gave their informed consent for their participation. A validated questionnaire consisting of two sections was administered to the subjects. The first section included questions regarding individual and job-related characteristics such as age, duration of employment, specialty, and basic education. The second section involved 17 questions focusing on the hearing capacity of the respondents, their family history concerning hearing loss, their personal history regarding hearing loss-related conditions, such as head injury or acoustic trauma and diseases such as diabetes mellitus, otosclerosis, Meniere's disease, acoustic neuroma, autoimmune diseases, thyroid dysfunctions, meningitis, parotitis, Lyme disease and vertigo, as well as the use of drugs that are implicated of causing ototoxicity (salicylates, aminoglycosides antibiotics, chemotherapeutics and loop diuretics). Hearing ability was measured at 125, 250, 500, 1000, 2000, 4000, and 8000 Hz for both ears. To determine the average hearing impairment we used a modification of the equation that was developed in 1979 by the American Academy of Otolaryngology, using for our calculation the hearing capacity at 500, 1000, 2000 and 4000 Hz. , For each ear, we summed the hearing ability (dBs) at these four frequencies and divided the result by four. From this average value, we subtracted 25 and then multiplied by 1.5%. Finally, we multiplied the result of the better hearing ear by five, added the result of the worse ear and divided the whole by six. The outcome variable that was included in the logistic regression models, expressed the percentage of hearing handicap (HH) and was divided into two categories, the first one including workers with a 0% of hearing loss and the second with hearing loss over 0.1%. An extra cut-off of 5% hearing loss was used in a descriptive analysis. Descriptive analysis took place for the available measurements per occupational category. Logistic regression analysis was performed to evaluate the influence of possible determinants on the occurrence of hearing impairment. Odds ratios (OR) with 95% confidence intervals (CI) were calculated as a measure of association. For the initial selection of potential factors that influence the level of hearing loss, univariate logistic regression analysis was used with a significance level of P < 0.10. Subsequently, all independent variables that showed significant associations were considered for inclusion into the multivariate logistic regression model. Data entry and analyzes were conducted by means of the SPSS v. 17 for Windows statistical package (SPSS Inc. SPSS Statistics for Windows, version 17, SPSS Inc. Chicago, IL, USA, 2008). [Table 1] demonstrates the individual and job related characteristics of the employees. The great majority was males (n = 727, 96%), technical school graduates (n = 485, 64.1%) and working over 10 years (n = 479, 63.3%). An 85.5% (n = 658) of the participants were blue-collar workers. After the application of the American Academy of Otolaryngology equation, the percentage of any HH was 27.1%, with an 11.8% being over 5%. The majority (72.9%) of the participants had no hearing impairment [[Table 2]]. [Table 3] presents the multivariate analysis of subjective factors on hearing impairment. Participants' subjective view regarding their hearing ability seemed to be the most important factor with an OR = 4.771 (95% CI = 3.028 − 7.517). The presence of tinnitus or the sense of ringing in subjects' ears, as well as the difficulty in participating in one-to-one conversations revealed strong associations with hearing loss [[Table 3]]. The combination of these four questions seemed to have a strong discriminatory power, with a positive likelihood ratio (+LR) of 4.17, which gradually decreased when one factor was absent. Thereby, the + LR for three factors being present was 2.579, for two factors 2.277 and for a positive answer to only one of these four questions just 1.678 [[Table 4]]. The stronger aggravating factors for hearing impairment was age, with an OR = 7.541 for workers older than 50 years, and the presence of past medical history (otosclerosis, Meniere's disease or acoustic neuroma) with an OR = 7.586. Other conditions that present a higher risk of developing hearing loss were the hyperlipidemia (OR = 1.787) and ear injury (OR = 2.729). Participants' basic education shows a strong association with hearing deterioration (OR = 4.661 for primary education graduates), as well as their specialty, with sandblasters (OR = 3.523) and crane operators (OR = 3.187) being the most affected working groups. Riggers and other blue-collar workers showed no significant associations with hearing impairment. Workers exposed to low levels of noise had the lowest percentages of HH [[Table 5]]. A worth mentioning finding was that the employees' subjective opinion regarding their hearing ability (consisting of four simple questions) could be taken into account in occupational health practice, as a cost effective screening tool, since a strong discriminatory power with a satisfactory +LR was monitored. Our study utilized objective and subjective estimates of hearing ability collected in occupational health department, though are considered of very high validity. Our scope was to estimate hearing ability and potential prognostic factors and not to establish a cause-effect relation of NIHL. The equation used was minimally transformed to be very similar to that used to calculate hearing impairment by the Greek state for compensation reasons. Field and personal exposure measurements were not presented due to the very high complexity of the shipyard environment. Noise-induced hearing loss is completely preventable, but scarcely research on the surveillance and prevention of hearing loss is published. Comprehensive hearing conservation programs by intervening both into the source of noise and in protecting each worker individually with the use of PPE and close surveillance are largely lacking in heavy industry in Greece. As a result, protective and control measures in heavy industry are not evaluated consistently and although laws for workers' protection have been adopted for decades, e.g. in Greece since 1991, only a few studies and reports on audiometric monitoring of workers have ever been published and even less comparative data for evaluating law efficiency are also available. The present study adds to the evidence that the problem is big and uncontrolled. , A national education campaign to increase awareness combined with enhanced pressures to industries to adopt preventive and control strategies is of necessity. The authors would like to thank all the employees that participated in the study and the personnel of the occupational health department (registered occupational health nurses Mrs. Drakoulaki K., Fanarisiou I., Foti D., Konstantinou E., Marmarokopou G., Tanagra D., and Mr Tsimopoulos P.) for data collection. Dr. E. C. Alexopoulos, occupational health physician, who acts as guarantor of the study, was affiliated with the HSY Company during the study period. Bogardus ST Jr, Yueh B, Shekelle PG. Screening and management of adult hearing loss in primary care: Clinical applications. JAMA 2003;289:1986-90. Tak S, Calvert GM. Hearing difficulty attributable to employment by industry and occupation: An analysis of the National Health Interview Survey - United States, 1997 to 2003. J Occup Environ Med 2008;50:46-56. U.S. Department of Labor, Bureau of Labor Statistics (BLS). Total Nonfatal Occupational Injury and Illness Cases, by Category of Illness, Private Industry, 2006; 2007. Available from: http://www.bls.gov/iif/oshbulletin2006.htm. [Last accessed on 2014 Jul 04]. Eurostat. Health and safety at work in Europe [1999-2007]; 2010. Available from: http://www.epp.eurostat.ec.europa.eu/cache/ity_offpub/ks-31-09-290/en/ks-31-09-290-en.pdf. [Last accessed on 2014 Jul 04]. Botelho CT, Paz AP, Gonçalves AM, Frota S. Comparative study of audiometrics tests on metallurgical workers exposed to noise only as well as noise associated to the handling of chemical products. Braz J Otorhinolaryngol 2009;75:51-7. Snow JB, Ballenger JJ, editors. Ballenger's Otorhinolaryngology Head and Neck Surgery. 16 th ed. Hamilton, Ontario, Canada: BC Decker; 2003 p. 357-73. Money A, Carder M, Turner S, Hussey L, Agius R. Surveillance for work-related audiological disease in the UK: 1998-2006. Occup Med (Lond) 2011;61:226-33. Masterson EA, Tak S, Themann CL, Wall DK, Groenewold MR, Deddens JA, et al. Prevalence of hearing loss in the United States by industry. Am J Ind Med 2013;56:670-81. Social Insurance Institute-Unified Insurance Fund of Employees: Occupational Diseases 2009 and Retrospective Data for 2003-2009. Available from: http://www.ika.gr/gr/infopages/stats/stat_reports/EODSFINALDOC09.pdf. [Last accessed on 2014 Jul 04]. Alexopoulos EC, Merekoulias G, Gnardellis C, Jelastopulu E. Work ability index: Validation of the greek version and descriptive data in heavy industry employees. Br J Med Med Res 2013;3:608-21. Rachiotis G, Alexopoulos C, Drivas S. Occupational exposure to noise, and hearing function among electro production workers. Auris Nasus Larynx 2006;33:381-5. Alexopoulos EC, Kavadi Z, Bakoyannis G, Papantonopoulos S. Subjective risk assessment and perception in the Greek and English bakery industries. J Environ Public Health 2009;2009:891754.
International Organization for Standardization (ISO)-1999. Acoustics: Determination of occupational Noise Exposure and Estimation of Noise Induced Hearing Impairment. Geneva: International Organization for Standardization; 1990. American Medical Association. Guide for the evaluation of hearing handicap. J Am Med Assoc 1979;241:2055-9. Ruan Q, Ma C, Zhang R, Yu Z. Current status of auditory aging and anti-aging research. Geriatr Gerontol Int 2014;14:40-53. Kidd Iii AR, Bao J. Recent advances in the study of age-related hearing loss: A mini-review. Gerontology 2012;58:490-6. Taylor B, Mueller HG, editors. Understanding Hearing Aids: Getting Started. 1 st ed. San Diego, CA: Plural Publishing Inc.; 2011. Moukos A, Balatsouras DG, Nikolopoulos T, Maragoudakis P, Yiotakis EI, Korres SG, et al. A longitudinal study of changes in distortion-product otoacoustic emissions and pure-tone thresholds in an industrial setting. Eur Arch Otorhinolaryngol 2014;271:2649-60. Sajjadi H, Paparella MM. Meniere's disease. Lancet 2008;372:406-14. Chole RA, McKenna M. Pathophysiology of otosclerosis. Otol Neurotol 2001;22:249-57. Marriage J, Austin N. Review of diagnostic hearing problems in childhood. Paediatr Child Health 2013;23:421-6. Thakur JS, Mohindroo NK, Vasanthalakshmi MS, Kashyap N, Azad RK, Sharma DR. Auditory brainstem evoked responses in hyperlipidaemia: Effect of various lipid fractions on auditory function. J Laryngol Otol 2012;126:249-56. Swaminathan A, Sambandam R, Bhaskaran M. Evaluation of the auditory effects of hyperlipidaemia and diabetes mellitus by using audiometry. J Clin Diagn Res 2011;5:1528-32. Shargorodsky J, Curhan SG, Eavey R, Curhan GC. A prospective study of cardiovascular risk factors and incident hearing loss in men. Laryngoscope 2010;120:1887-91. Aimoni C, Bianchini C, Borin M, Ciorba A, Fellin R, Martini A, et al. Diabetes, cardiovascular risk factors and idiopathic sudden sensorineural hearing loss: A case-control study. Audiol Neurootol 2010;15:111-5. Nilsson R, Lidén G, Sandén A. Noise exposure and hearing impairment in the shipbuilding industry. Scand Audiol 1977;6:59-68. Prince MM. 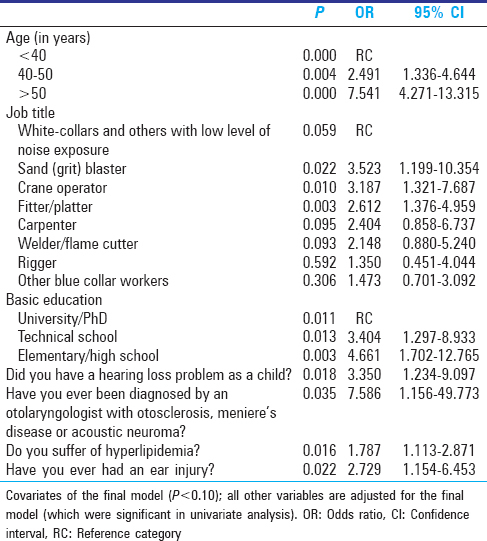 Distribution of risk factors for hearing loss: Implications for evaluating risk of occupational noise-induced hearing loss. J Acoust Soc Am 2002;112:557-67. Mahboubi H, Zardouz S, Oliaei S, Pan D, Bazargan M, Djalilian HR. Noise-induced hearing threshold shift among US adults and implications for noise-induced hearing loss: National Health and Nutrition Examination Surveys. Eur Arch Otorhinolaryngol 2013;270:461-7. Greek Ministry of Labour and Social Insurance. Presidential Decree 85/91: Protection of Workers from the Risks Related to Exposure to Noise at Work, in Compliance with Directive 86/188/EEC; 1991 Available from: http://www.ypakp.gr/uploads/docs_editor/aye/YP_231-288.pdf. [Last accessed on 2014 Jul 04]. Fernández MD, Quintana S, Chavarría N, Ballesteros JA. Noise exposure of workers of the construction sector. Appl Acoust 2009;70:753-60.